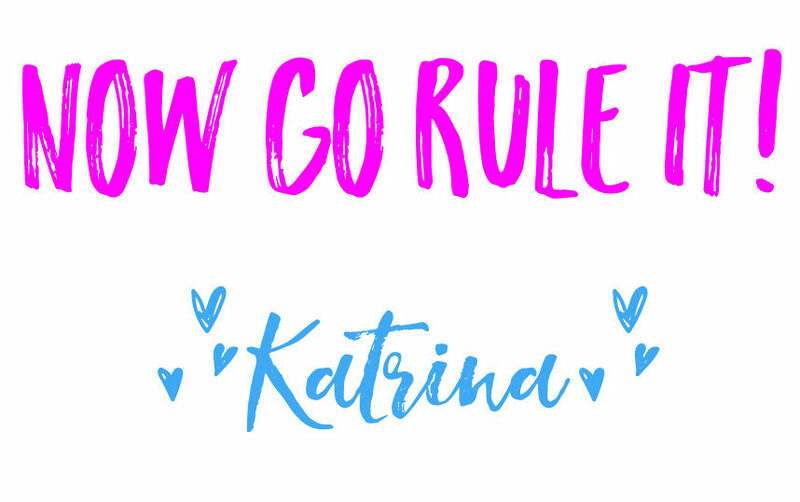 I don’t know about you, but I sure do wish someone would give me the magical formula and tools to keeping my money budgeted! It can be so difficult getting organized and perfecting your monthly budget. You don’t want to be hung up on finding a template that works for you. You just want to get to the budget part! When we started seriously budgeting our money, I looked high and low for the perfect monthly budget template. Eventually I just created my own that would fit our situation. 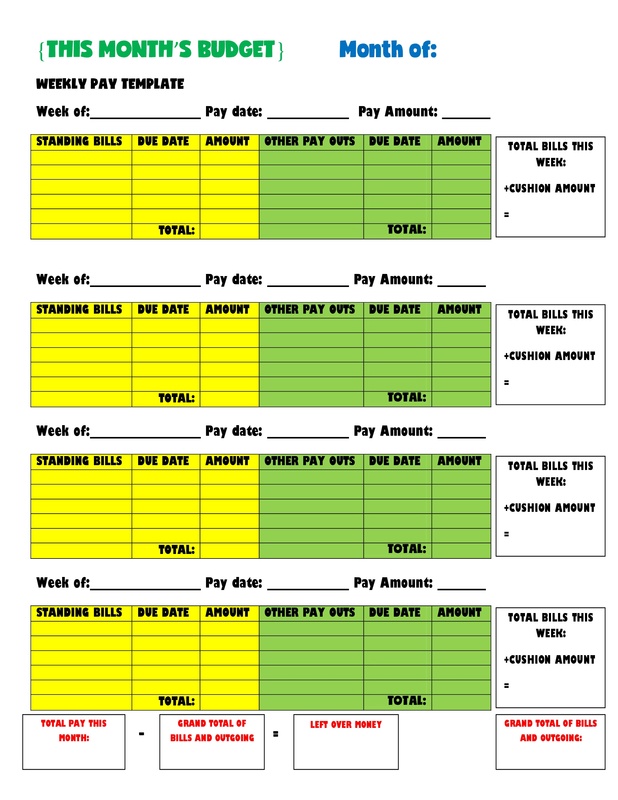 Whether you get paid monthly, weekly, or biweekly, there is a budgeting template that will work for you. Why have a monthly budget template? When you start budgeting your money, it is really important that you find a budget template that works best for you. Your monthly budget template is going to be your working document for the entire month, so you don’t want to skimp on it. It took me several months to find the budget sheet that worked for me. I would write everything out and try out different combinations, and eventually one template just stuck with me. Your monthly budget template can be something that changes, but it makes it a lot easier when you choose a style and stick with it. What should you look for in a monthly budget template? 1 | A simple design. When you are searching for, or creating a monthly budget template, make sure that it is one that is simple to read. I like a minimalist look, nothing fancy. This helps me to focus on the numbers, and not on a bunch of design on the page. 2 | A place to put dates. It’s important to have a place to put dates in your budget template. I like to be able to quickly see the month, the pay period dates and the dates that each bill is due. 3 | A place to list your income. Whether you get paid weekly, or monthly, make sure there is a place for that. It’s great to have a budget, but you also need to know how much income you are working with. This might seem obvious, but some people don’t actually know what they make. Don’t estimate, get a solid number. 4 | A place to list outgoing money. Make sure that you also have a place for every.single.cent of outgoing money. If it is a standing bill, just as electricity, or a mortgage payment, I put it in a category of its own. Other things that I pay for, such as birthday gifts, or car registration, go in my “other pay-outs” category. 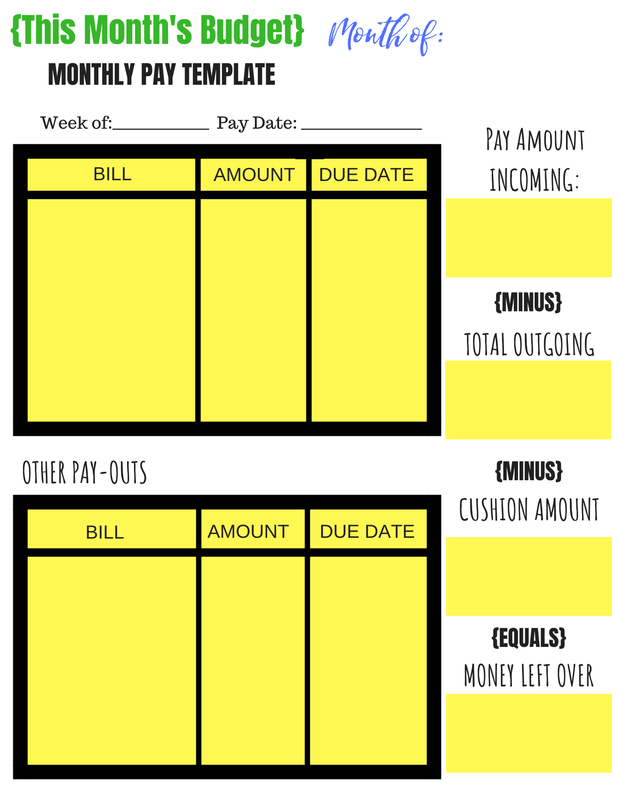 When you have your bills and other pay-outs categories set up, you also need a “total” for the money going out each week. That way, you can easily do the math of incoming and outgoing money. 5 | A place to list your cushion money. This is the money that I leave in our account to make sure we don’t overdraw our account, should I forget to add something to our budget. This amount will be different for each family, but make sure it is there. And don’t spend it! Consider it a mini-emergency fund. 6 | A place to show your leftover money each month. 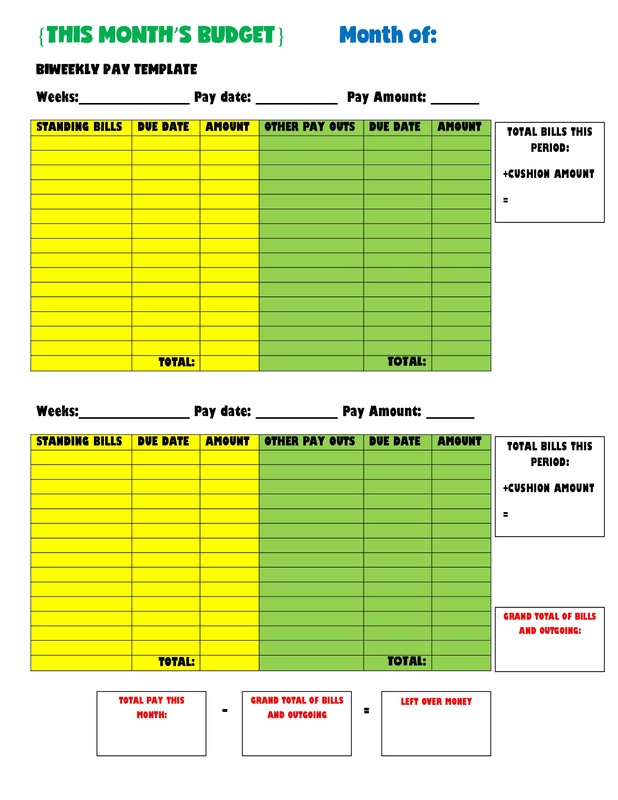 The last thing I like to have in a template is a section where I can see how much money is left over each week and/or month. I am a saver by nature, so seeing that number really solidifies my vision each month. Final thoughts on budgeting and monthly budgeting templates. Budgeting is a great way to get your finances in order and build wealth. No matter the amount of money you bring in each month, having a solid budget will move the financial needle quicker. 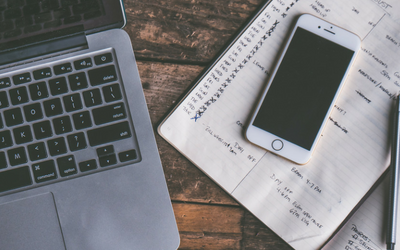 Using a monthly budgeting template is important so you keep your finances organized and easy to use. 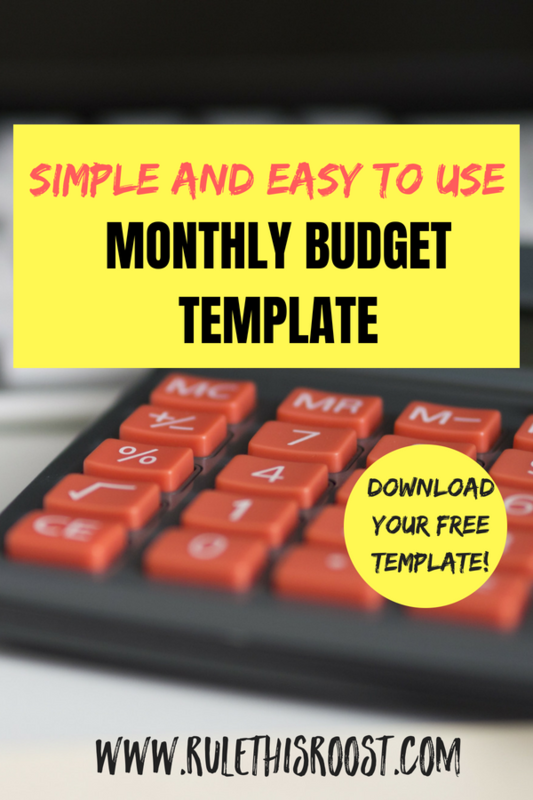 CLICK BELOW FOR YOUR FREE MONTHLY BUDGETING TEMPLATE DOWNLOADS!